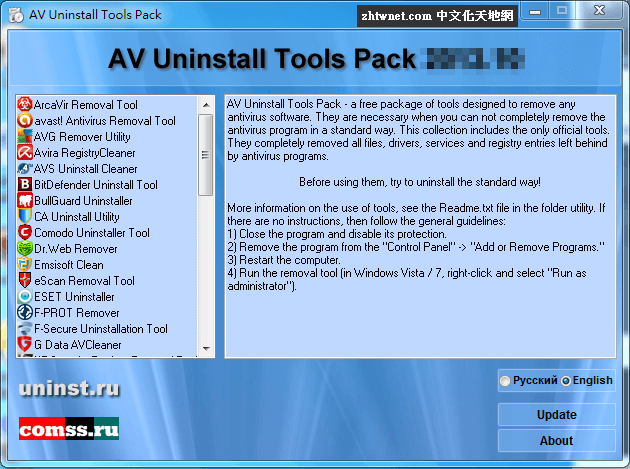 AV Uninstall Tools Pack – a free package of tools designed to remove different antivirus programs. It includes tools for removing more than 30 antivirus and antispyware programs and firewalls. They are necessary in cases when it can not completely remove the antivirus program in the standard way, or in the process of removing errors. These utilities completely remove all files, drivers, services and registry entries left by antivirus programs. These tools will be useful for those who often deals with reinstalling and configuring the software. Note that some tools are not intended for use as a primary means of uninstall. Before using them, try to uninstall the standard way. 幫助使用者決定可以刪除哪些軟體 – Should I Remove It?